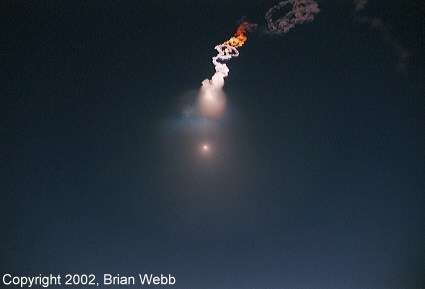 This series of photos was taken during the rare dusk launch of a Minuteman III strategic missile from Vandenberg AFB on 2002 September 19. 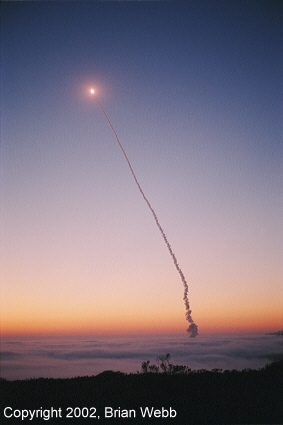 Minuteman III test launches almost always occur during the middle of the night or middle of the day. 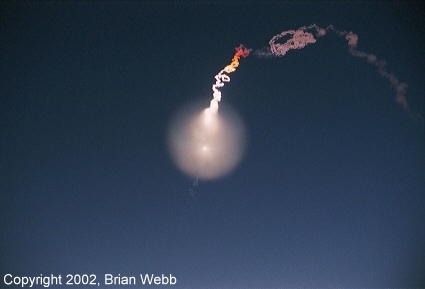 However, this test launch, referred to as Glory Trip 180GM, was scheduled for late afternoon and ended up being delayed until evening twilight, resulting in optimum conditions for a fine visual display. The event was seen across much of the American Southwest and was captured by a security camera on a farm in eastern Utah near the Colorado state line. The Minuteman sent one or more unarmed reentry vehicles (warheads) to an impact area in the central Pacific. The Minuteman climbs rapidly after leaving its silo. 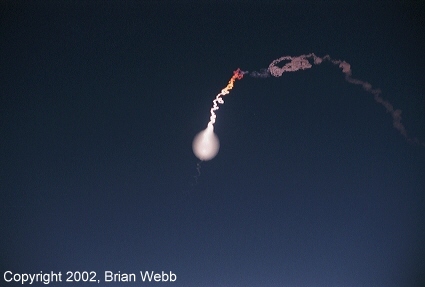 The exhaust plume begins to expand as the vehicle climbs. 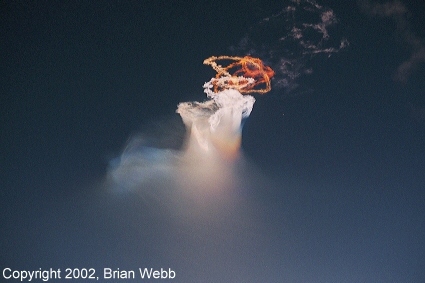 The exhaust plume continues to expand and lobes resembling flower petals were visible. The plume reaches its maximum size. The plume begins to fade as a vehicle upper stage (bright spot) continues to burn. 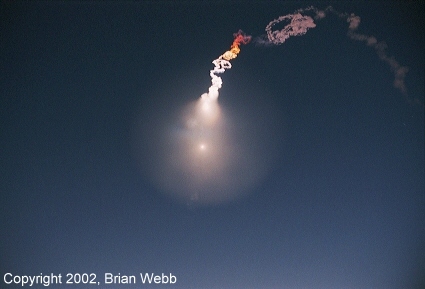 After the Minuteman disappeared, an iridescent, glowing cloud was visible high in the west. Copyright © 2004-2006, Brian Webb. All rights reserved.